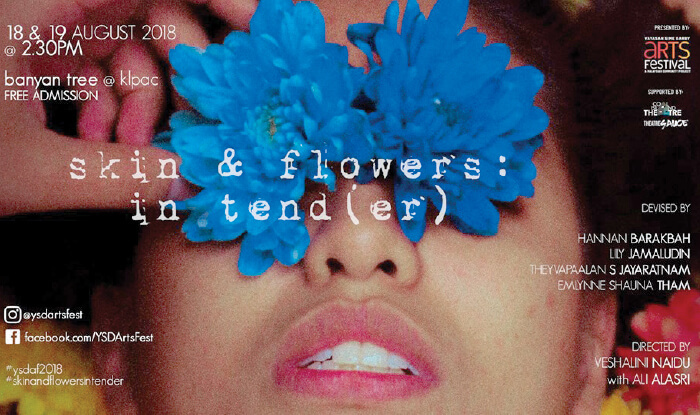 This year, Yayasan Sime Darby Arts Festival brings you Skin and Flowers: In Tend(er); a hybrid performance combining elements of physical theatre with a poetry piece creatively exploring peculiarities relating to our bodies, using the language of tenderness. The performance piece is inspired by the “Skin and Flowers” watercolour series by Veshalini Naidu, as well as the poetry of Nayyirah Waheed and Lily Jamaludin. Make your way to Banyan Tree @ klpac, Jalan Strachan, Off Jalan Sultan Azlan Shah, Kuala Lumpur to see it. Admission is free. Visit www.ysdartsfestival.com.my and email [email protected] to find out more. Head on over to Malaysia Design Archive to catch Absent Without Leave. 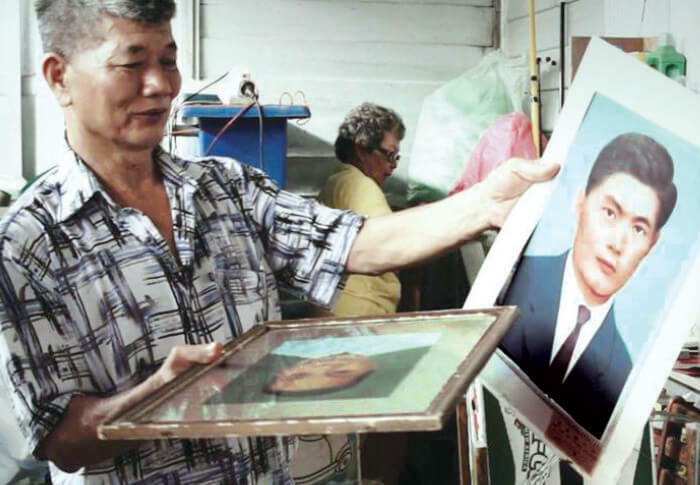 Directed by Lau Kek Huat and released in 2016, the film tells the touching — and somewhat controversial — story of a man discovering his grandfather’s hidden identity as a member of the Malayan Communist Party. The director’s debut feature film, A Love of Boloumi, which told the story of his own family, garnered multiple awards and unparalleled support from the Asian film scene. Catch the screening this Sunday at 2.30pm, at Malaysia Design Archive, No. 84, Jalan Rotan, Kampung Attap, Kuala Lumpur. Visit www.malaysiadesignarchive.org for more information. Tonight, The Bee hosts none other than Brendan De Cruz, a folk musician that is well known and adored in the local music scene. Celebrating the release of his third album, entitled III, De Cruz brings his talent to the stage and showcases his brand new hits — alongside other musicians such as Battle Bloom, Volatile, Nadir and Dranoel Sinclair. Attend the album launch tonight (Aug 17), 8pm at The Bee, Level G2, Publika, Solaris Dutamas, Kuala Lumpur. Tickets are RM20 at the door, and RM40 if you’re looking to get your hands on the album, too. Visit www.thebee.com.my for more information. If you’re looking to try something new this weekend, look no further than the Museum of Illusions. With exhibits such as The Vortex Tunnel, Optical Illustions, the Rotated Room, The Chair Illusion and many more, this is the perfect place to tease the eyes and trick the mind — as well as get some incredible, Instagram-worthy shots. The museum is located at Ansa Hotel, 101 Jalan Bukit Bintang, Kuala Lumpur, and is open Monday to Sunday from 9am to 11pm. Admission fee is RM45 for adults, and RM35 for children. Visit www.museumofillusions.my for more information. The Little Prince is a French classic that tells the tale of a charming young boy who leaves the safety of his little planet and travels the universe, experiencing bizarre encounters and learning lessons of adult vagaries throughout his voyage. 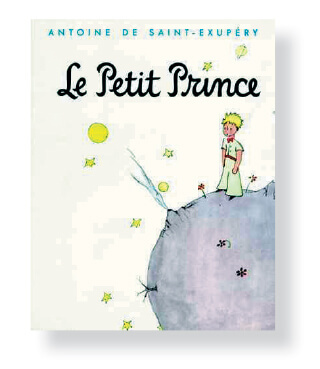 As the most translated book in the French language, The Little Prince is a timeless and beautiful moral allegory worth picking up. It is available for purchase at Kinokuniya both in-store and online, for RM29.50. Find it at Kinokuniya, Suria KLCC, Kuala Lumpur, or log on to malaysia.kinokuniya.com. In his short play, Who’s Afraid of Virginia Woolf?, Edward Albee depicts a small social gathering where tensions are at an all-time high. Middle-aged Martha and her husband George invite young couple Nick and Honey around to their place for late-night drinks after a party, we are invited into the hilariously toxic world that is Martha and George’s wedding. 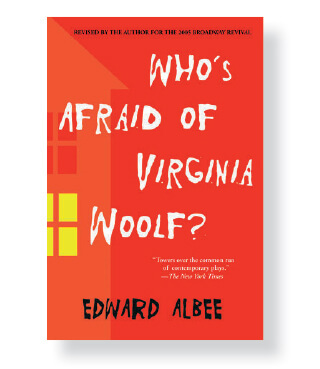 An original and witty read, Who’s Afraid of Virginia Woolf? is a play worth reading. It is available for purchase in-store at Kinokuniya, Suria KLCC, Kuala Lumpur, or log online at malaysia.kinokuniya.com, for RM73.52. 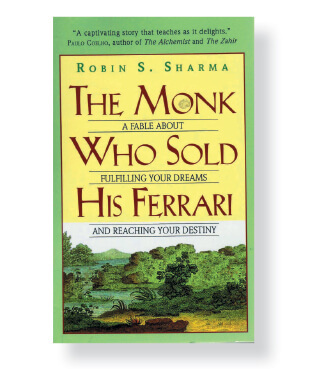 The Monk Who Sold His Ferrari is a self-help classic that depicts the inspiring journey of Julian Mantle, a dignitary and competent lawyer who tipped the scales of the work-life balance too far towards the “work” side, causing to have an almost-fatal heart attack in a crowded courtroom. Embarking upon a spiritual odyssey, Julian discovers the happy and healthy ways of a spiritual lifestyle, which he returns home to impart to his former colleague. This book is definitely a worthwhile read, teaching vital life lessons that otherwise may remain undiscovered. It is available online at malaysia.kinokuniya.com, or in-store at Kinokuniya, Suria KLCC, Kuala Lumpur, priced at RM34.90. Devote your Saturday afternoon to learning about an important aspect of Malaysian history. 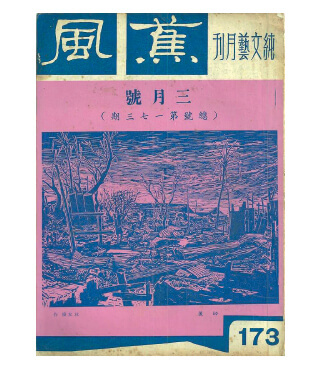 Make your way to Sinophone Literature in the Making of Malaya — a talk by Dr Show Ying Xin exploring the ways in which literary identity was built by writers in post-war Malaya, who utilised literature as a method of expressing contention at a time when the nation was coming into being. The event takes place this Saturday from 3.30pm to 5.30pm at Malaysia Design Archive, No. 84, Jalan Rotan, Kampung Attap, Kuala Lumpur. Visit www.malaysiadesignarchive.org and the event’s Facebook page for more information. 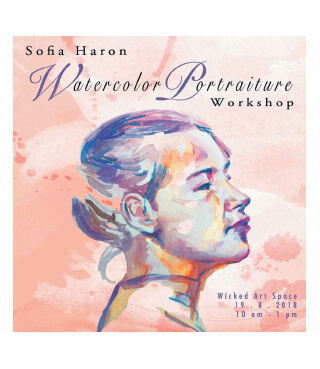 This Sunday, Penang-born, visual artist Sofia Haron is making her way to Wicked Art Space to offer a Watercolour Portraiture Workshop, sharing her expertise on painting intuitively while using basic techniques that are the foundation of creating stunning works of art. The artist specialises in and is best known for her figurative works using mixed media. Learn this timeless skill for just RM120 per person — no prior experience or skill is required! Go on over to Wicked Art Space, 10, Jalan SS7/17, Petaling Jaya. Email [email protected] or call (019) 671 2649 to reserve your slot. Sign Language is probably the most unorthodox language we can learn, and it is vital that we ensure that our peers, who are hard of hearing, do not feel marginalised. 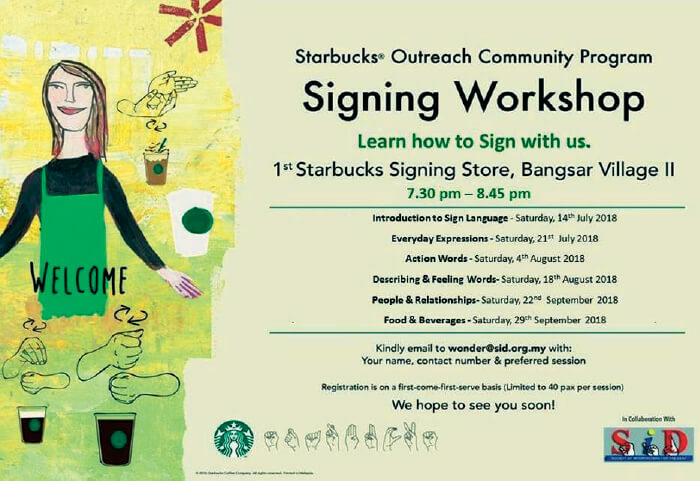 This weekend, Starbucks offers an opportunity to beat society’s ableism with their Outreach Community Programme Signing Workshop. With workshops on every Saturday, this weekend’s session teaches us how to express describing and feeling words. This initiative is run by Starbucks in association with the Society of Interpreters for the Deaf. It takes place at 7:30pm at Starbucks @ Bangsar Village II, Jalan Telawi 1, Bangsar Baru, Kuala Lumpur. Email [email protected] with your name, contact number and preferred session to book a slot.